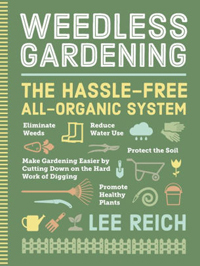 Sixty pages into Lee Reich’s new book on Weedless Gardening, it finally occurs to me that this book is not just about eliminating weeds, it is really a book detailing good gardening practices while reducing some of the backbreaking work. This is a very good book on good gardening practices. The author begins his newest book with a short history of typical garden practices (but we have always done it this way!). He then describes the concept of thinking of the soil first, in a top down approach of using Mother Nature as his example. Mother Nature nourishes the soil from the top down, not plowing or tilling the soil every spring. Except for setting up a garden the first time, Mr. Reich dismisses the idea that the garden soil needs to be tilled before every planting. Lee Reich describes an alternative to any tilling. This is the idea of laying out newspaper and unprinted cardboard onto the soil to eliminate turf lawn or weeds, covering with compost; working with nature as soil organisms eat their way through the paper and cardboard. Planting can even be done through holes in the cardboard to get the garden started right away. At one of WMMGA’s community service projects, the Hospice of the Fisher Home, we have started a few new gardens with this cardboard method in the fall, then planting in the spring. These gardens have very few weeds. There is one other new garden, a small space of 6 foot by 12 foot, that we started by removing the sod and turning the soil over. This garden bed takes one of us at least an hour to weed every week. Mulching and edging the garden are also important in this method, to keep weeds at bay, shelter the soil from damaging wind and drying sun, and even providing nourishing compost when mulching with a cover crop are some of the other ideas that the author recommends. His in-depth description of drip irrigation, includes a sample worksheet for calculating the drip irrigation timing, with the amount/ frequency of watering for your garden size is included. This chapter ends with a list of drip irrigation suppliers. The last three chapters of this book draw from his depth of expertise in the vegetable bed, the flower garden, fruit plants, trees, shrubs, and vines. Some of the most important information in this book is on the topic of maintenance of garden areas, not only for better yield, but less weeds! I recommend this book to first time gardeners (it gets to the heart of topics quickly) and to old-time gardeners for an up-date on gardening methods. Lee Reich is an experienced gardener, garden writer, and lecturer. His gardening column appears in the Sunday edition of my newspaper. Not only do I read each one carefully, I save them in my gardening file. I also refer to his Pruning Book before I take out my pruning loppers. This book is published by Workman Publishing, and includes illustrations by Michael A. Hill.